Please note this is for the glaze only. You will get a wonderful quality of glaze, but we can not duplicate the actual ham. Make Logan Farms Honey Glaze for your ham. Cut 1/8" deep strips through ham skin, about 1/4"apart. This step may be omitted if the ham is a spiral cut ham. Mix the spices with honey. If you are using a 1/2 of ham place the sliced side down on the baking tray. Pour the honey mixture over the ham, making sure that is covered completely. Place ham in the refrigerator uncovered for two hours. When time is up removed ham from refrigerator and pat excess moisture and cover with unrefined sugar. Place back in the refrigerator for half an hour while the oven is preheating. 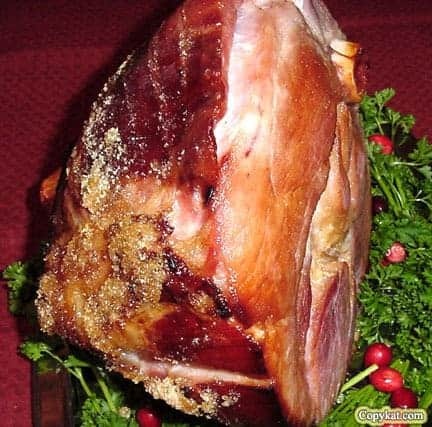 Bake ham uncovered at 325 - 350 degrees according to directions if partial cooked or bake until heated through. This glaze is very different and will give that ham dinner a time to remember. This glaze is wonderful. It doesn’t make the crust that is on the Logan Farms Honey Glazed Ham, BUT, I, and my husband, think the flavor of the ham is actually better with this glaze. This will be our third time to use the recipe. I would like any suggestions someone might have about how to make the sugary crust that is on the Logan Farms Ham. As to not get in trouble I am using a fake name. I used to work at Logan Farms for several years. We spiral sliced our hams in house and then we would use sifters full of sugar and blow torches to get the glaze. You place the ham on a table with a ring to hold it up. Slowly shake the sugar onto the ham and use the blow torch to melt the sugar. You continue to add sugar and melt it. Be careful not to burn the sugar but also be sure the sugar melts fully. Once the sugar is golden brown and melting off of the side of the ham they had a seasoning rub you would add. To the best of my knowledge it was a mix of sugar, all spice, ground cloves, and cinnamon although I do not have the recipe as they came in giant buckets. This is the same process we did for the turkey breast as well. I know this is about 4 years late but I hope it helps. I bet this tastes amazing on turkey! I love this glaze, I have never been able to get my glaze to taste as good as Logan Farms. I will be using this at Christmas.